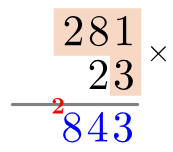 Multiplication is a form of repeated addition, i.e. multiplying numbers amounts to adding several copies of a number together. Division is the opposite of multiplication, it amounts to finding out how many lots of one number go into another number. Both of these operations can get quite difficult when we have to deal with bigger numbers, so we’re going to look at 2 methods of multiplication and 2 methods of division for dealing with trickier situations. 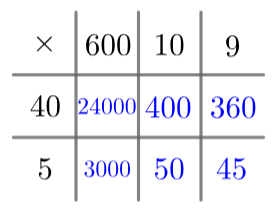 The two multiplication methods we will see are the grid method and long multiplication. 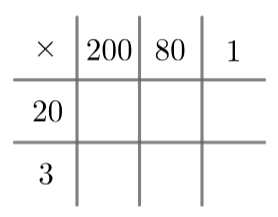 Example: Work out 23\times 281 using the grid method and long multiplication. 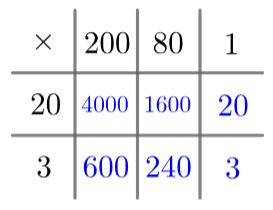 The grid method involves splitting each number into 1s, 10s, 100s and so on, and writing each component of one number along the top of a grid, and each component of the other number down the left-hand side, as seen on the left. This is precisely the result of the multiplication, i.e. 23 \times 281 = 6,463. Long multiplication involves the same idea of multiplying each component at a time, but it’s structure is a little more compact. To start it, write the bigger number over the smaller one, making sure that the 1s are above each other, the 10s are above each other and so on. Keeping everything in the right column matters a lot here. 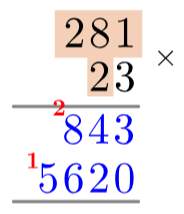 Then, we want to multiply each component of 281 by the “3” part of 23 and write the results of the multiplications under the grey line. 1\times 3=3, so we write a 3 in the 1s column under the grey line. Then, 8\times 3=24, but we can’t write “24” in one column. What we do is write the 4 in the 10s column and carry the two over to the 100s column. Then, 2\times3=6, but we carried over an extra 2, so we write 6+2=8 in the 100s hundreds column (see: right). Now, we do everything we just did but this time, multiply each component of 281 by the “2” part of 23. The only difference is because the 2 represents a 20, everything is shifted one space to the left and a zero is put in the 1s column. For the completed step, using same methods as before, see: left. Finally, we add together the blue numbers and write the final answer underneath the second grey line. The answer (as we already know) is 5,620+843= 6,463. For the completed process, see: right. Have a go at both of these methods and decide which you prefer – it’s completely up to you which one you use. The two division methods we will see are long division and short division. Example: Use long and short division to work out 288 \div 9. For long division, draw a rotated L-shape with the number we’re dividing (the dividend) on the inside, and the number we’re dividing by (the divisor) on the outside. Now, see how many times the divisor, 9, goes into the first digit of the dividend, 2. 9 goes into 2 zero times, so we write a zero on top of the line above the 2. Then, we multiply this value by the divisor, 9\times 0=0, and write the answer below the two (see: left). Next, we subtract the number below the 2 (zero) from 2 and write the answer underneath the zero. After that, we move onto the second digit of the dividend, 8, and bring it down to sit next to the result of this subtraction (see: right). We’ve now seen all the steps involved, we just have to repeat them as many times as necessary until the division is complete. So, now we ask how many times our divisor, 9, goes into 28. The answer is 3, so we write a 3 above the top grey line, in line with the second digit of the dividend. 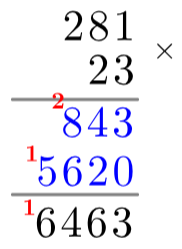 Next, we multiply this 3 by the divisor to get 27 and write the 27 underneath 28. Next up, we subtract 27 from 28 to get 1, write the 1 underneath, bring the next digit of the dividend down and repeat this whole process. Once your divisor has 3 digits, then you just have to one final subtraction to determine the remainder. 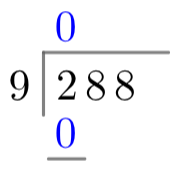 As you’ll see on the left, this gives us the answer: 288 \div 9 = 32 with no remainder. For short division, we begin with exactly the same setup. From there, we ask how many times 9 goes into 2 and write the answer, zero, above the line, as before. Then, we write the remainder of this division, 2, in the gap just before the next digit of the dividend (see: right). 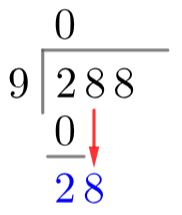 Then, we ask how many times the divisor goes into the number formed by that remainder and the next digit, which here is 28. So, 9 goes into 28 three times with a remainder of 1, meaning we write a 3 above the line and a 1 in the gap before the third digit of the dividend. This process is exactly the same and repeats until we get to the end of the number (see: left). If the divisor doesn’t fit perfectly into the divided, you can either stop once you get to the end and take the final remainder to be the remainder of the whole division, or you can put in a decimal point and keep going until you’re satisfied with how many decimal points you have. As with multiplication, try both these methods and see which one is better for you. 1) Work out 45 \times 619. 2) Work out 315 \div 14. Here we’re going to use the short division method, but the long division method is completely fine too (as long as you get the answer right). So, we draw our sideways L-shape with 315 on the inside and 14 on the outside. If you stopped at the decimal point and wrote the answer “22 remainder 7”, then this is correct for this question, but you should practice finding the whole answer, even when decimals are involved. For tutors and teachers looking for GCSE Maths resources, Maths Made Easy offer a whole host of revision materials which are arranged in a very user friendly way. As a professional Maths tutor you can also advertise your Maths tuition in Leeds, London, Manchester, York and every major city in the country.